Welcome to the Bleeding Cool Community, we hope you enjoy your visit. Unregistered users have full access to view all threads, but we hope you'll take a moment to register and participate here as well. Thank you! Sadly a whimper rather than a bang. It was a great magazine that's time has been superseded by the internet. Having spent a few years as an associate editor on the title (and editing you, Rich!) I'll miss it. Future's Comic Heroes looks like it could replace it, and there's always Tripwire! Otherwise it's all online and you don't have to wait a whole month to see your insane and ill-thought out rantings in print on the letters page. Sadly the "instant feedback" aspect is one of the less attractive elements of the internet. "Think before you type" seems to have been a long forgotten maxim. It's a sad end to what used to be a UK comics behemoth. "You might think that. I couldn't possibly comment"
Quantum Field Theory? I've never been any good at these acronyms. Haven't read it for an age but back in the day that I used to have a comic shop, this was a great mag. Sad stuff. I haven't seen an issue anywhere since #200. Bought it religiously for years and always tried to get Wizard buyers to give it a go to see what "real" comics magazine looked like. And it introduced me to one of my favourite comics, Rex Mundi, by printing the Brother Matthew web comic in it's pages. Ah, that is a shame. 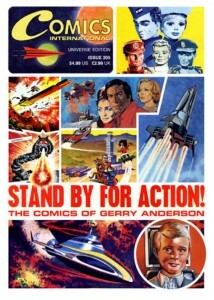 I gave it up shortly after Dez left because of the sudden historical bent of the mag – ancient ‘news’ and an apparent obsession with Gerry Anderson. I can’t seen Comic Heroes filling the gap, unless it moves up from quarterly publictation and stops charging £15 or whatever for a pile of ‘free’ tat. I think I last purchased an issue about 4 years ago, which is about the last time I went in a comic shop. I remember back in the day, that is how I would find out what was coming out. Yes, a real shame. Under Dez it was the best resource for news, commentary and reviews that you didn't have to read on a screen. I even wrote some of those reviews for about two years before it went missing in action.